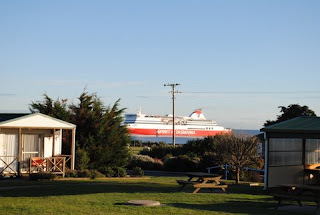 We left Devonport in the Spirit of Tasmania II on Saturday morning. It was a little late in leaving because it arrived from Melbourne a little late. We started embarking at about 8.00 am. We had arrived at about 6.15 am. According to the blurb that we got from the shipping people we could go into the wharf area approx 3 hours before. Start embarking 2.5 hours before departure and the latest we could get there would be 8.15 am. There were cars and other vehicles still being booked in as we were embarking. We shoved off into the Mersey River (Devonport's river) at around 9.45 am under an overcast and rainy sky. The passage itself wasn't too bad. A little boring because there wasn't much to do. We were lucky because we had a cabin where we could go back to and have a snooze or get away from all the people that were circling around the restaurant, bars and gaming area. We at least were able to have breakfast, lunch and afternoon at the Captains Table. (The cafeteria area was called the Captains table). Even though they had a captive audience the prices weren't through the roof, just passing through the ceiling. The passage was uneventful and we arrived in Melbourne at about 7.20 pm, about 1 hour 20 minutes late. They again observed union rules (first on last off) and we were among the last vehicles to leave the vessel. While on board we were able to check for some accommodation and settled for a motel in Seymour. It was $75 per room and we got what we pain for. The room that Deb and I had was a smoking room and we could tell. (I didn't think there were such things in this day and age.) We arrived there at about 9.45 pm and were away the next morning at about 8.00 am. We breakfasted at the local Maccas and were on the road to Gunnedah at about 8.45 am. The trip to Gunnedah was uneventful and I think everyone was keen to get there. We arrived in Dubbo at 5.20 pm and after a toilet stop headed for the nearest Hog's Breath where we had a good feed and were on the road by 6.30 pm. Poor John Welch got a surprise when he came down to turn on our heater. The washing machine was running. Jan and Nerissa had come in to wash some clothes after their visit to the Western Plains Zoo at Dubbo. We arrived home to a nice warm house with a bit of washing ready to be hung out. Jan was coming back in the morning to hang it out but we thought we might surprise her. I don't know how much our accommodation cost because the tour manager hasn't divulged that information. This is the last of the Tassie Tourists blogs. We hope you have enjoyed them. I think it was a good way to let everyone know what we had been up to. 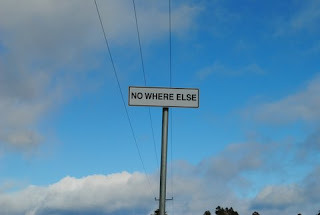 Our last day in Tasmania has been nice and quiet. While we were waiting to go out this morning the Spirit of Tasmania was coming into the Mersey River. The caravan park overlooks the entrance. Hopefully it wont be as late tomorrow. This morning we went to Don which is just down the road. 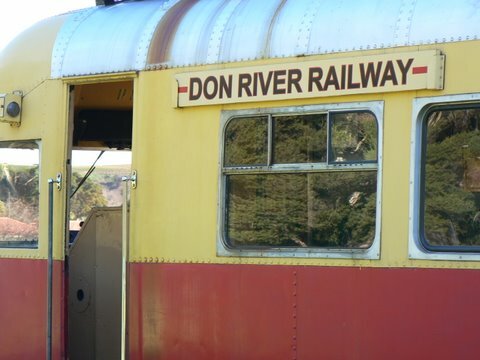 The Don River flows through the town and there is a small railway that is run by enthusiastic volunteers. 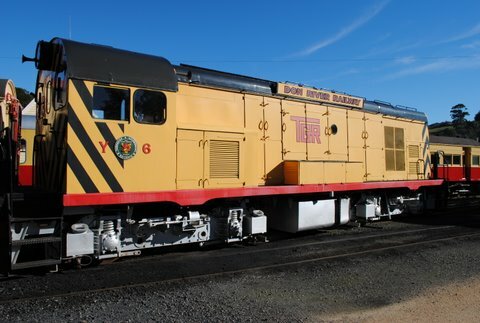 The name of the Railway is the “Don River Railway”. As usual the people working there were very helpful and enthusiastic telling us all about the railway and what would be good places around the district to visit. 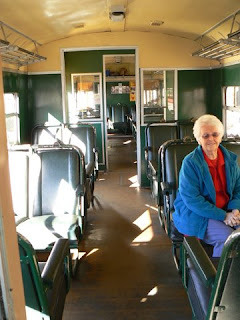 We took a ride in the rail motor type train that they run every hour. 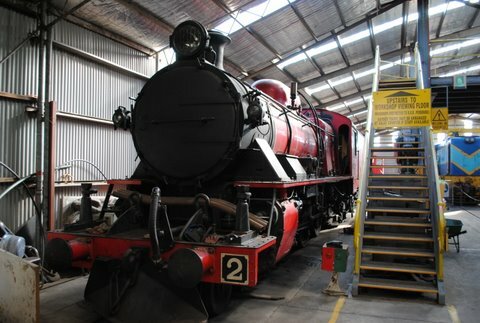 The ride was basically from the restored railway station to the end of the river where the Don River Railway line meets the mainline from Burnie to Hobart and Launceston. The driver gave a running commentary all the way pointing out some of the various sites and buildings of interest. When we got to the end of the line we stopped and got out to stretch our legs (which we needed to after 10 minutes) and had a talk to the driver who told us a little about what the organisation was all about. Deb did her normal thing and asked for two pensioners, one senior and one normal person. Because there is normally a different price and for pensioners/seniors and normal people they normally charge the cheaper price because it is easier to work out. It works nearly every time. It did this time. Before the trip Phil and I had a lo ok through their workshop where they had some rolling stock set up as displays. They also had some interesting steam driven machinery on display as well. There was a steam generator set from the 1920's that started life in Queensland and a marine feed w ater pump. They also had the engine and running gear from the type of locomotive that we did our trip on. Judy met us for coffee in the shopping mall and then we carried out some retail therapy. Henry came to see us during his lunch hour which passed very quickly but it was really nice to catch up with him. Judy and Henry are very good friends and we will have to return some time in the future. 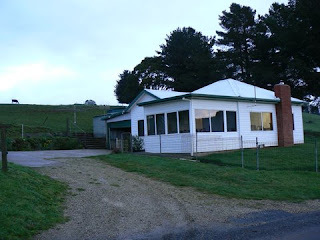 We have just arrived back from a nice meal of meat and vegies at the local bowls club. We were the only ones there and the service couldn't have been better. The people there were the usual chatty type that we have come to expect from the people in Tasmania. 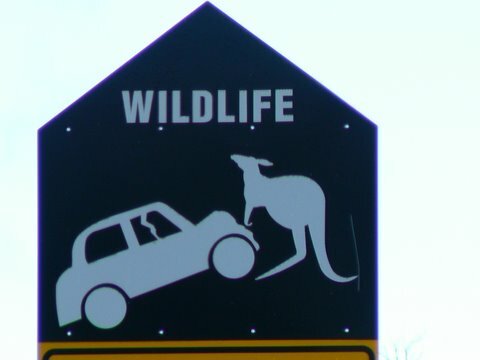 I have put in a picture of the wildlife warning signs that are displayed around the state. I will let make your own mind up about who is coming off second best and what is doing what!!. We'll be up early tomorrow morning. We went to get some information from the Spirit of Tasmania people today and they said we won't have to get there until just after 7.00 am. Hopefully it will be on time so we don't have to sit around waiting too long. I'll try and get a blog off before we get to Melbourne tomorrow evening. Yesterday Deb took me to Paradise! Today she took me to the Promised Land and Nowhere Else. We left Penguin today in bright sunshine with very few clouds in the sky. It was really warm and I didn't even have a jumper on. The temperature was about 12 degrees. 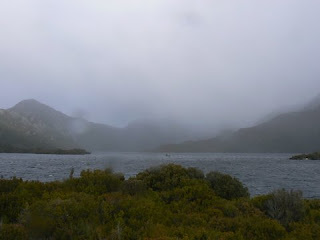 Deb rang the Visitors Centre at Cradle Mountain to see what the weather was like and they advised that at the time it was cloudy but could change at any time to either very cloudy or bright sunshine. It was decided that it was one destination that we should see so away we went. 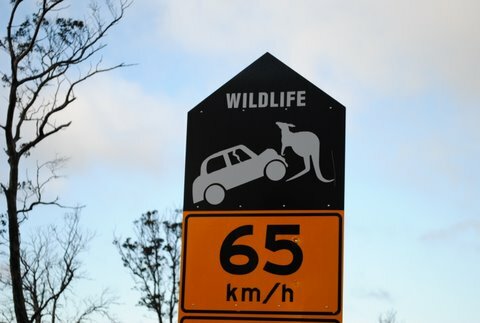 The road to Cradle Mountain from Penguin went through some very scenic back roads. I decided that we would try and avoid some of the roads that we took yesterday down to Sheffield and Railton so that we would have some different scenery to look at along the way. It was reasonably successful as we only went down a few roads again, a couple of which we went in the opposite direction. Along the way we went through a couple of localities that I wanted to visit. I like unusual town or locality names ever since I found that there was a town in Queensland called Muckadilla. The places in Tasmania I wanted to visit were Paradise, visited yesterday, Promised Land and Nowhere Else. I visited the last two today. 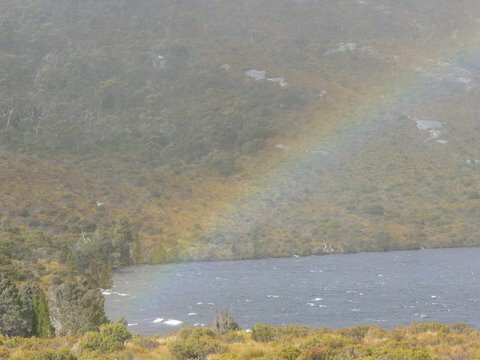 Cradle Mountain was definitely worth the visit. It was raining, windy and sunny all at the same time. The temperature when we were there was 5 degrees with the wind gusting to at least 200 km per hour, or at least that is what it felt like. I didn't have an anemometer with me but I reckon that the wind speed would have been about 20 km/h which would have given an effective temperature of 1.4 degrees. (I checked on Google). While we were having a look at a replica of a cabin used by one of the pioneers in the region a wombat just happened to walk by. 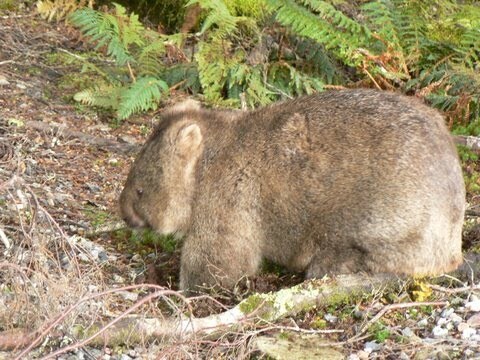 He didn't seem to take any notice of us even when Deb chased after him through the bush. He just waddled along. The scenery is tremendous. Even with the rain which wasn't heavy and the breeze which was blowing well we saw lots of stuff that we would see nowhere else. There is so much water flowing in all the little creeks and streams. The ranger at the visitors centre told us that they get on average 3 metres of rain a year. Some other interesting statistics are that 7 out of 10 days it rains, 8 out of 10 days it is cloudy and 1 out of 10 it is sunny. I feel sorry for the helicopter charter service based here. It would be nice to take some of the rain home with us to make things look a little bit like it is down here. Green!!! 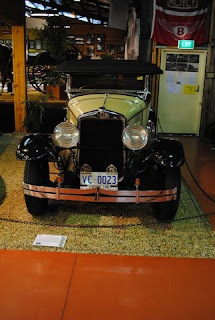 We visited a gallery of photographs at the Cradle Mountain Chateau on our way home. They were magnificent. There are 10 rooms each with about 20 photographs in each. The average size was 80 cm X 50 cm. We could have purchase prints of each of them for between $440 and $1100. Would have been nice but I think with the 1224 pictures that Deb and I have taken so far we are more than likely to get at least one of the same quality. I think that at least one of my pictures of the blow hole at Bicheno will be nearly as good. I'll just have to get a good frame. 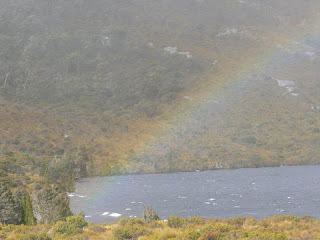 The trip back to Devonport was in bright sunshine which appeared as we cleared the Cradle Mountain National Park. We can't complain about the weather because we have been able to see everything that w e wanted even though we had to modify the way we did it. We are going to have a quiet day around Devonport tomorrow. We might go to the Don Railway and then have lunch with Judy and Henry. Let you know in tomorrow's blog. We woke up this morning and it was still raining heavily. According to the weather forecast last night it was very widespread over Tasmania. We checked with the visitors centre at Cradle Mountain and they told us it wouldn't be worthwhile us going down there because we wouldn't be able to see anything so we decided to go down to Sheffield through Wilmot and then to Railton. 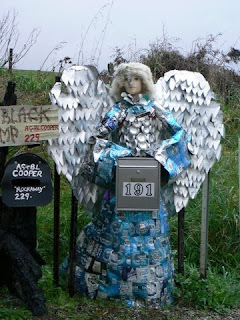 On the way to Wilmot we went along the letterbox trail. 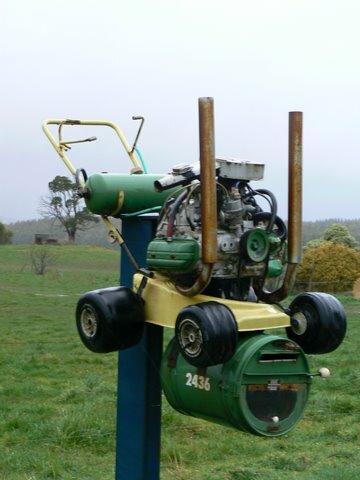 A lot of the properties along Wilmot Road have made their letterboxes a little different to normal. There are some that are made in a similar design to the house that they are outside. Other letterboxes look like Ned Kelly, angels, motor mowers and Tassie Devils. We took about 3 0 photos of these letterboxes so there were a few. Today Deb took me to Paradise!!! 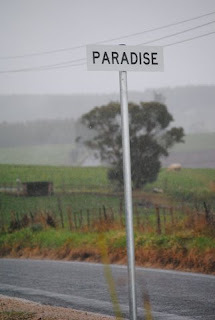 On the road to Sheffield from Wilmot we passed the turnoff to a village called Paradise. 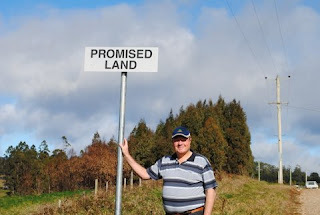 It was one place that we saw and wanted to go to and the other was Promised Land. We'll have to wait for our next visit to go to the Promised Land. 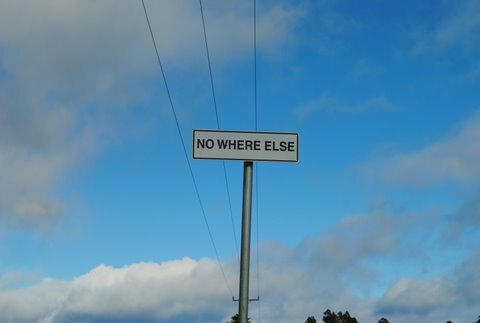 I would also like to visit Nowhere Else when we come ba ck. Sheffield is the town of Murals. 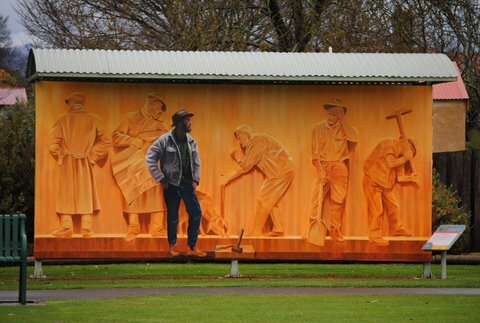 A few years ago Sheffield was going through the doldrums and a local person got the idea to put up some murals around the town. Evidently once the murals went up so did the fortunes of the town. There is a mural competition every year and there is a mural square where the murals of the competition are displayed for a year. After the year they are sold off and the murals of the next competition are displayed. They are really good. Some we didn't like but most were nic e.
Railton is the town of Topiary. 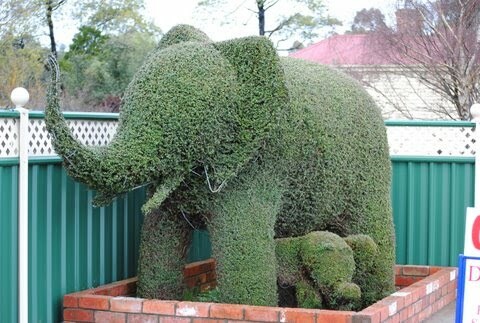 Topiary is the art of making figures out of bushes. They have a frame where the shrubs are encouraged to grow through. When the frames are filled the shrubs are pruned to shape. There are shapes like elephants, people and other animals. Some are not yet fully developed but when all of them are there will be about 50 to 60 of them around the town. We came back through Devonport and booked our accommodation for Thursday and Friday nights. We have to leave here tomorrow so we thought it would be a good idea to get a place close to the ferry. The ferry is only about 5 minutes away from where we are staying. 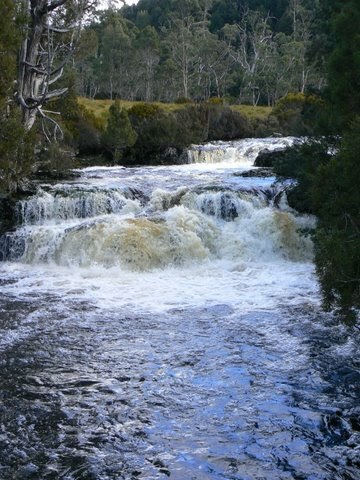 Hopefully we will be going down to Cradle Mountain tomorrow. The rain started to go away late this afternoon so we might be able to see something tomorrow. I'll let you know in tomorrow's blog. Today Judy came down to us at Penguin and we headed to an attraction that Judy hadn't visited. 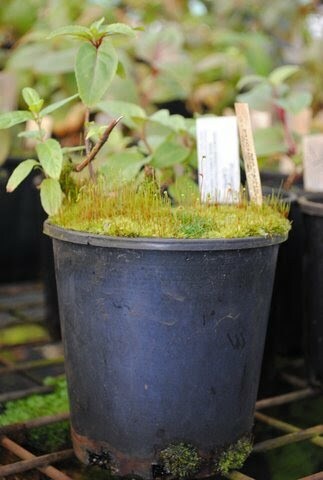 We went to a local business that has a greenhouse and tea rooms. 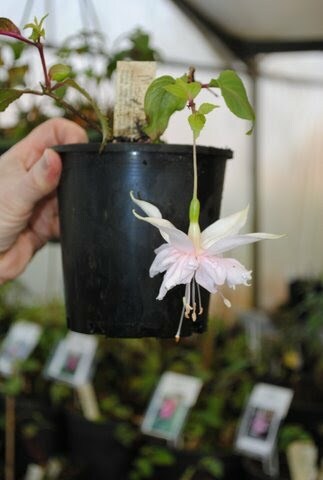 The people who own the business used to be farmers and grow fuchsia as a hobby, now they grow them full time. There were hundreds of plants in the greenhouse, most of which were flowering. There were all sorts of colours and we found a white one called Miss Debbie. 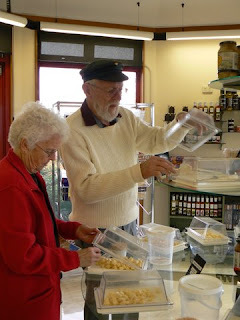 After our visit to Fuchsia Fantasy we went into Burnie to have another taste of cheese. Phil had got a taste of it on our first day in Tasmania and we had to go back and make a purchase. Penguin was our venue for lunch. Judy had brought some home made chicken soup and we had it with some nice fresh bread rolls that we had purchased earlier in the day when we visited a small shopping centre with some specialist stores. There was a delicatessen that had lots of different cheeses, hams etc.. We spent a while there just looking at everything. 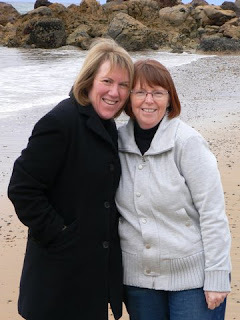 The beach is about 30 metres behind us and Judy, Deb and I went for a walk along there this afternoon. The breeze was quite strong and cool. I didn't check to see what the water temperature was like because I had no intention of going in. Judy said that it gets to about 16 degrees during the summer. For me that is still about 10 degrees cooler than I feel is suitable for bathi ng. Although it was very brisk the company made it quite pleasant. This afternoon Judy left us at about 4.15 pm and as she left the rain started to fall and it has rained fairly heavily since and it is now nearly 9.00 pm. Hopefully it will not be raining in the morning because we will be heading for Cradle Mountain. Evidently it sometimes snows and along with it comes black ice. I will be taking it very easy. I'll let you know what is was like in the next blog. We came into Burnie to meet Judy for coffee at the Makers Market where various crafts persons display their wares for sale. Today there was a paper maker and an artist featured. From there we followed Judy back to her place and she joined us for a cruise down the coast to Ulverstone. In Penguin we checked out some alternate 2 bedroom accommodation at the Penguin Holiday Apartments which we decided to take. 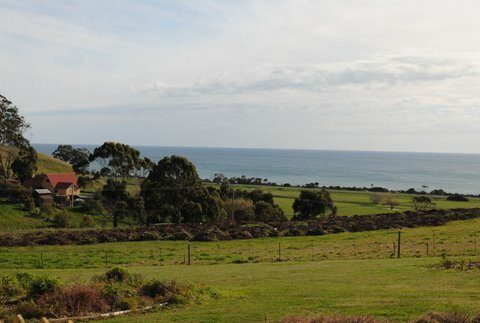 The road to Ulverstone follows the coast very closely. I cannot recollect anywhere on the mainland that has surf, road then farms all within about 10 metres of each other like they have down here in Tasmania. It is really picturesque. I'll try and get some photographs of it tomorrow. Today I didn't get my camera out so this blog is a bit short of photos. At Ulverstone we had lunch and partook in one of Judy's favourite pastimes of looking through antique shops. The one we had a look at today had some really nice stuff. There were some great Royal Dalton dinner sets that would have been nice to bring home. Would have made a big hole in the holiday budget. After lunch we went out to Natone where we had stayed last night and we did a quick pack up. The people there were really nice. Because we were leaving part way through the day we offered them two days payment. They wouldn't accept so we will try and get something nice from Gunnedah to send them in appreciation of their consideration. We have settled in to our accommodation and Judy and Henry came down to have a meal with us. Judy made a tuna pasta dish which was very nice. I think everyone had seconds. We then had dessert which was pretend brandy snaps filled with caramel and topped with cream. Very nice. It has been a very slow day for us today but really nice because we have been able to catch up with Judy and Henry. Tomorrow will be around the Burnie area checking out the local attractions. This morning it started to rain as we left our accommodation and has rained off and on for the whole day. 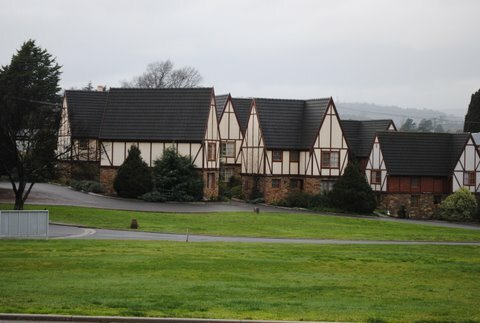 Last night and Friday night we stayed at the Alanvale Apartments, (genuine imitation Elizabethan architecture). It was a ground floor 2 bedroom unit that suited us down to the ground. To fill in time we drove around Launceston for a while before we went down to Evandale to see the Tasmanian Gourmet Sauce Company. They make all their own sauces and jams there. The marmalade made from Seville oranges with Tasmanian Whiskey. Really nice and so was the raspberry sauce, blackberry sauce and boysenberry sauce. The other sauces there were also very nice. We headed back to Launceston and Phil and I visited the National Automotive Museum of Tasmania. They have a really good selection of vehicles from buggies that were pulled by horses to Roll Royces. 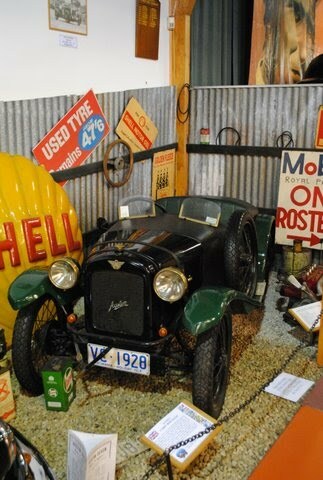 There were two vehicles whose coach work was done by the same company in Launceston, one was a 1928 Buick whose coach work was fabricated from aluminium. I really liked the Ford GTHO and Cortina GT 500 that they had there. Deb and Pat went somewhere to have a cup of coffee while we looked around. I cannot understand why they didn't want to come with us. From Launceston we headed towards our overnight accommodation at a B&B at Natone. It took us up towards Devonport then towards Burnie. It took us to a town Deloraine where we had lunch at another Empire Hotel. The food here had a distinct Thai flavour. Deb and Pat were very boring and had fish and chips while Phil and I were a little more adventurous with ginger fish and rice. After lunch we travelled for about 40 km to Ashgrove Cheeses. They specialise in cheddars and harder type cheeses. Some of them were very nice. Deb bought a small piece of smoked cheddar. It didn't taste really smoky to me but Deb liked it. At the cafe/cheese tasting centre they had full sized models of cows. 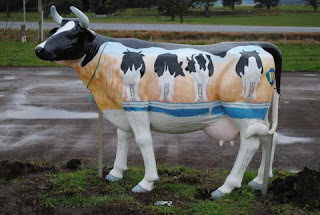 There was only one there that looked like a real cow, all the others had been painted. The cows are painted by school kids as a project for the class. 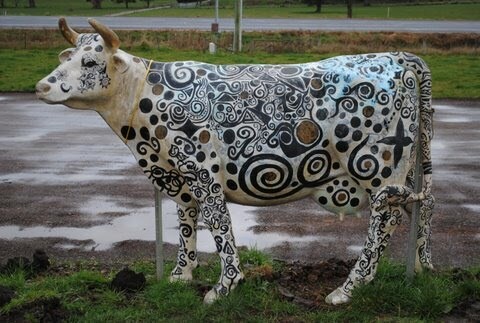 There are some very interesting patterns on the cows. Our destination for the day was Natone Fly Fishing B&B about 5 km from the township of Natone which is south of Burnie. It has three bedrooms a large kitchen/lounge area with a wood fire. There was butter and eggs in the fridge and after we arrived Christine (one of the owners) brought milk and bread over. There is jam, peanut butter and Vegemite as well as tea, coffee, sugar etc. There is not much we will want while we are staying here. We may have a bit of a rest day tomorrow. I'll have to find somewhere that I can get mobile service so that I can upload the blog.